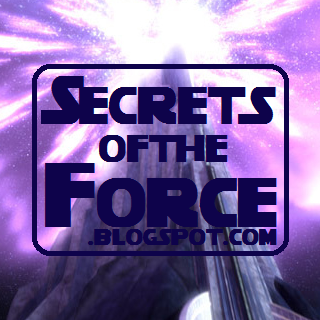 "The thoughts and dreams of a Jedi knight in the making." The olive skinned Jedi sat in her confined cell in the Republic prison. All around her were the most vile criminals in the galaxy. Her freckle shaped tattoos across her nose scrunched up as she thought of how that arrogant knight, Anakin, had exposed her for her wrongdoings. Barriss buried her face in her palms as she contemplated how long she would be trapped in this wretched place. With that she rose and moved through a small door at the back of the cell where there was a long desk bolted to the floor, and it was separated down the middle by a thick piece of transparisteel. On the other side of this sat a human male dressed in dirtied old rags as if he had been digging through garbage. The clones who had escorted him in gave her a cold look through their visors and then left the room. She sat down across from the figure. After glancing around the room he waved his hand and all the security monitors, including droids, blacked out. “Now we can talk.” He said opening up his ragged wardrobe exposing the Jedi robes beneath. Tutso Mara just sat there and smirked. “That was me.” He revealed. “I’ve mastered the ancient Sith art of Transfer of Essence. I knew there was some parts of my plan that you couldn’t carry out so I took the liberty of doing them for you.” As he spoke a gray shadow passed over his eyes. “And now I am more powerful than ever.” Barriss found herself saying as she recoiled her from her chair. “How does it feel, my little puppet.” He said with a cold charismatic smile. “Why did you come here? To gloat?” Barriss said with new found anger. “No . . . “ He said coldly. Suddenly Barriss was on her feet when she blacked out. She woke up on the floor with clone guards looking down on her. She rose and saw the transparisteel barrier shattered and dismembered rags strewn across the floor on the other side where Tutso had been sitting. “Don’t worry, we saw everything.” One of the guards said, something in his voice suggested something was afoot. Two of the clones grabbed her arms and held her tight. “What? No! That wasn’t me!” She screamed and kicked as the clones dragged her away. “No!”. She screamed before she blacked out again. Ahsoka boarded the heavy Transport, her montrals and lekku hidden under a cloak. She was on her own now, the Council, and Jedi, were behind her now. A wide eyed Rodian reached for a blaster at his hip and she instinctively reached her her lightsabers only to remember she had left them behind. I'm a nobody now . . . She thought as she looked out over the glistening city planet of Coruscant. "Now leaving for the Outer Rim." A voice blared over the speakers as the cargo doors closed out the galactic center with a metallic thud. Where should she go? What would she do? She mingled with the other refugees, if she were a Jedi she could have helped these people have a better life, now she was one of them. A stranger in a strange place. No free taxi rides, no perks, just an ordinary galactic citizen. She still had the Force. She recognized a little Twil'ik boy who pointed to her, she smiled back, at least she had done some good in the galaxy before she left. "You seem troubled." A voice said and she was snapped out of her thoughts. The speaker was a young human boy about her age, sixteen, seventeen maybe. "It's nothing." She replied back not making eye contact. "What happened? Did you lose someone?" He inquired. The ship rumbled as the landing gears extended. "We have arrived on Dantooine. Please exit to your left. Thank you." The same monotone voice announced. "My name's Bessen, look me up." He said reaching into his pocket and handing the Togruta a small card. "Um, thanks." Ahsoka replied stashing the card. Soon Bessen was lost to the crowd that was herded off the giant ship. Ahsoka followed them rubbing shoulders with beings from every corner of the galaxy. The city was small, a mining outpost, maybe, that looked like a ghost town in the making. She watched as the great boarding ramp retracted and the ship hovered above the ground and then shot into the upper sky to ferry the next batch of refugees to a better life. "Ahsoka? Is that you?" An all too familiar voice said from behind. She turned to see, of all people, Lux Bonteri, the rebel senator wading through the crowd towads her as if it was a thrashing sea. "What are you doing here?" He asked through the bustle. "Lux, I, I left the Jedi." "Why?" He asked truly concerned. "I'd rather not talk about it, Lux." "A close friend of mine attacked the Temple and framed me for it." She confessed. "I'm sorry." Was all he said. It was all he could say. Ahsoka cracked a small smile at his accent, she always found it cute. "So what are you going to do now?" He asked. "I don't know . . . " She trailed off stealing a glimpse at his thick, unkempt, dark brown hair. "You helped restore order on Onderon. You're a hero. You're my hero." Even now she still held her feelings deep inside her and kept a straight face, like the remark meant nothing. She turned her back to him and tried to look busy. "Well . . . If that's how you feel." He said turning and heading the other way, a sad note hung in his voice. Her emotions screamed at her, pushing and pulling, in a million different directions. She was letting the love of her life just walk away. It was what the Jedi would have wanted, but, was it what she wanted? “Lux, don’t leave.” She said turning and running to him with tear filled eyes. “Lux, I’ve loved you since the day we meant, and I can’t imagine life without you.” She finally said. It felt like a bantha was lifted off her chest. She clenched his hand tight. “Lux, please, don’t leave. I need you.” She met his warm eyes, eyes that had seen courtrooms and battlefields and maintained their alluring glow. She lowered her head onto his chest and listened to his heartbeat. Ahsoka stayed there as long a possible not wanting to face whatever he may say. Lux placed a warm hand on her back and held her there. Their eyes met again and then it happened. He planted a firm kiss on her lips leaving her dumbfounded for a second. And then she kissed him back, this time with all the passion she had pent up for him over the years. “Do you really have to bring that up now?” Lux remarked sarcastically. They held each other for awhile as Ahsoka felt waves of energy ripple around them along with something else. Love? Finally they released and held each other’s hands. “That sounds wonderful.” She said beaming. As she followed Lux she remembered Bessen’s card. She stopped and pulled it out to examine it for the first time. Bessen’s Armory and Weapons: Headquarters on Dantooine. “Is everything alright?” Lux asked looking back at the love of his life. While I've always been a fan of Ahsoka this episode only served to boost my admoration for her even more. The sheer emotion carried by the music and animation took my breath away and this is by far the best episode so far in my opinion. I'm truly bewildered as to how Ahsoka will get out this mess and clear her name. Will she be able to return to Anakin? Will any sense normancy ever be possible again or has she reached the point of no return? I don't have answers to these questions and that's what makes this episode truly fantastic. Does she know something that we don't? Who framed her? I could speculate for hours and I can't stop praising the brilliance of this episode. One theory that I've proposed is that the dead Jedi, the one who trained Barriss, faked his/her death so as not to be suspected of scheming. And they may have forced Barriss herself to be part of their plan which is why she was acting so strange and not making eye contact. Another theory is that Ahsoka was framed by a Jedi deserter who was assumed dead and brought back through technology, much like Vader, this could possibly be the masked feminine character we see Ahsoka fighting in the trailers, or it could be Ventress. Or Barriss could have framed her best friend on her own. While this seems irrational it's still possible. Whatever the case I can't wait for tomarrow's episode. Ahsoka sat in the Temple library consumed by silence as she watched the minutes tick by. Ever second of ever second a small eternity; the embodiment of utter boredom. She looked at her wrist communicator. Who could she contact? Who would liberate her from this invisible prison? The com beeped sounding louder then normal in the silence. "This is Ahsoka Tano." She said into the device. 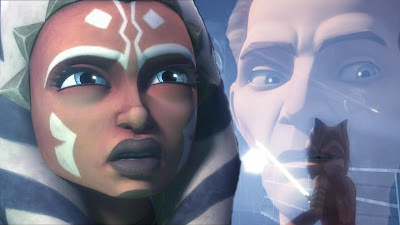 "Ahsoka, this is Barriss, I was wondering if you wanted to hang out with me. Maybe we could have dinner in the city." Ahsoka replied;"Sure. I need to get out any way. Obi Wan was telling me of this really nice place. He says he knows someone who works there." "What's it called?" The other Padawan asked. "Ummm . . ." Ahsoka said trying to remember. "Dex, yes, Dex's Diner, I'll send you the coordinates and meet you there." With that she closed the channel. Finally an escape. 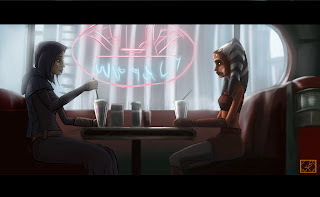 The two Padawans arrived at Dex's Diner. Its interior a snapshot from a simpler time. The pair found a booth seated themselves. Both girls took in their vibrant surroundings. Unlike the rest of the city planet the Diner was cleaner and not perverted by modern advertising and what have you. "What are you going to have." Barriss asked watching her own menu. "I don't know. I wonder if their nuna is any good." Ahsoka answered. "Why hello there Jedi." A bellowing voice said and both looked up. It was the Diner's owner and namesake Dex; a pot bellied, four armed, alien with a welcoming air that smelled of grease. "You must be Skywalker's Padawan." He said giving Ahsoka a wide grin. "Yes. That's me." Was all she was willing to say. "It's an honor to have you here. Obi Wan has told me so much about you." Both girls gave each other looks. "That's great, umm, do you have anything new. Maybe exotic?" Barriss asked eager to change the subject. "Of course, and since both of you have done so much for our Republic how about I prepare a special dish just for the two of you"
"Sure." Ahsoka answered while Barriss weighed the risks. With a giant grin Dex left the two and headed for the kitchen to prepare their meal. "What are you doing?" Barriss asked as she leaned over the table pondering her friend's logic. "C'mon Barriss, lighten up, we deserve it." Barriss sat back with mock satisfaction at her friend's answer. There came an animal cry from the back followed abruptly by the sound of a blade contacting flesh. Barriss cringed and Ahsoka could sense her gag reflex. The remaining minutes they waited were filled with the usual ambient noises and nothing extreme. Dex emerged carrying two large steaming platters. "Enjoy, my friends." Dex said leaving them to enjoy his creations. The large platters smelled savory and was an assortment of steamed veggies and meat; maybe nuna meat. "Not bad." Barriss remarked at the food quality. "Told you." Ahsoka said back almost smirking through her filled cheeks. "No. No; I need these as soon as possible. They're a huge hit." They heard Dex say to someone in the back. "I don't care what it costs. I need this for the Jedi Special. It's . . ." Dex's voice was lost to the other noises. "Who do you think you are. . . Butchered . . . Endangered and ruined lives." Was all they were able to decipher. With their mouths full both girls looked each other in the eyes and then they looked to their plates. It wasn't nuna. And it wasn't nerf either. What was it? I thought this was an awesome episode even though a few points were a bit slow. Maul's babbling to himself and his frantic nature right away reminded me of the former Hobbit from "Lord of the Rings" known as Gollum. And his underground lair on the planet Lotho Minor reminded me a lot of Raxus Prime from The Force Unleashed game. Those Fire-breathers were an awesome sight. Granted Anakin and Ahsoka had some brief moments on scene but they weren't really a part of the overall plot. And I liked the moment where they played a bit of the Force Theme which made the episode all the more awesome. It was awesome seeing Dexter's Diner in the Clone Wars even if Dexter himself wasn't there. I must say this episode was almost flawless and flowed very well from scene to scene. Savage's snake guide adding a bit of comic relief but not must and in the end he served his purpose and wasn't overdone. Overall this was a good setup episode for next week's finale which promises to be very dark and twisted. Thanks for reading. Until next week . . . . The air was heavy with the stench of sweat and blood as Cad's intense red eyes peered into the dead gaze of an Imperial officer; his plain grey uniform stained red by his own blood. The Duros placed his pistol back in its holster at his hip and looked coldly to his partner; a rather stout man with a blank stare and a head wrapped in white cloth as if it were covering some deep wound, in fact, the wounds were beyond skin deep. "Come on. We've got a job to do." Bane said to his partner in his rasping voice as he moved to complete the mission. "Not until you cut me in on the pay, you slimy Neimoidian." Dengar said reading his blaster rifle. Bane stopped dead in his tracks and slowly faced the man, a new kind of red burning in his lidless eyes. "What did you call me?" He said as his hand slid towards his pistol. "That's right." Dengar continued undaunted by Bane's sudden turn on him. "You're a slimy, low down, Neimoidian coward," At that moment something primal snapped in Bane and he whipped out his pistol and squeezed off two shots but not before Dengar was on top of him with a drawn vibroblade. Dengar sliced the weapon from Bane's hand and cut the pistol on his opposite hip as well. Bane looked to his dismantled weapons and then to Dengar saying; "Oh, you don't want to be doing that boy." With that he delivered a devastating blow to Dengar's nose causing it to explode with blood. With inhuman efficiency he recovered and began twisting the alien's wrist the wrong way only to have an electric jolt pulse through his body. He dropped the vibroblade and collapsed to his knees. Bane recovered one of his pistols and placed his muzzle to Dengar's forehead. "Now." He said. "I'll be keeping my credits if it's alright with you." Seeing no sign of dissent he placed the weapon in his good holster and recovered its twin. He looked to Dengar with cold eyes. "On your feet. We need to recover those stolen plans from Alderaan's senator." I really enjoyed this episode. The Box was a very interesting training course for the bounty hunters, and to me, seemed to be a physical embodiment of the inner workings of Maralo's mind. I was actually afraid for the characters in this episode unlike last week's episode which seemed relativity uneventful. The ever shifting environment of the Box was a very interesting playing field for our wannabe contenders for Dooku's mission. In all not a whole lot of character development in this episode and it failed to really establish anything and built up little for the finale. In all it was a cool episode. I'm looking forward to the conclusion next week. Until next time. I'm an eighteen year old Star Wars fan writting my own Saga. "I don't know what to say," "I do. Thank you." -- Anakin and Ahsoka. "Your reckless young one, you never would have made it as Obi-Wan's Padawan. But you just might make it as mine." -- Anakin to Ahsoka. Padawan's Journal. Awesome Inc. theme. Powered by Blogger.